Does your horse exhibit any of the following? • Wring or carry his tail off to one side. 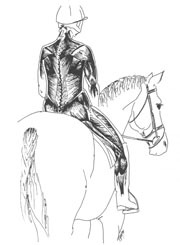 These are possible signs indicating that your saddle may be hurting your horse. Tell-tale sweat marks and white hairs arrive long after the irritation begins. Changes to the horse's whole attitude can progress to refusals, bucking and unruliness as they become more intolerant to the pain. Too often it can reach a level where a sore-backed horse is incapable of performing or is dangerous to ride. Utilizing several tools I can help you to evaluate your current english or western saddle and make recommendations for how to improve your saddle fit or educate you about what to look for in a new saddle. The Port Lewis Impression pad is one of those tools. It is made of clear flexible vinyl filled with moldable putty. 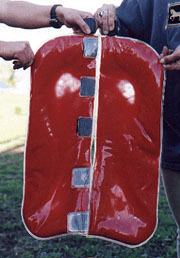 The pad is placed between the saddle and your horse’s back. Then ride your horse for 20 minutes doing regular flat work. The end result is an exact impression of how that saddle fits that horse with you riding. This information is then used to make recommendations for modifications in pads or flocking to improve the fit for your saddle and comfort for your horse. In the market for a new saddle? Another useful tool is a template of your horse to show the general shape and width of your horse. I will show you how to use this template to evaluate saddles, in the shop, to help you choose a saddle that more closely matches the shape of your horse. Looking for the ultimate in comfort and performance for you and your horse? Consider a free two-week demo of a ReactorPanel saddle. Click here.